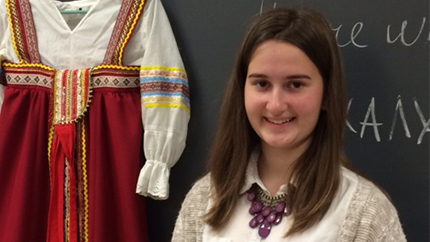 Liza, a FLEX exchange student from Russia, poses with a traditional Russian outfit. Yelizaveta (Liza), an AIFS/AYA Future Leaders Exchange (FLEX) program student from Russia, is a natural leader and student ambassador. In addition to her making the honor roll, Liza has completed over 100 hours of community service in only three and a half months. She volunteers at Bethany House (a homeless shelter), Habitat for Humanity, and the Humane Animal Shelter. In her free time, Liza is active in the Family, Career and Community Leaders of America (FCCLA) and Latin American Dance clubs. During homecoming, she participated in the annual girls’ powder-puff football game. For International Education Week, Liza gave five presentations about Russia. Her audience sat riveted in their seats, all eyes on Liza as she captivated them with a 50-minute presentation where she taught the audience several Russian words, quizzed them, and handed out prizes from Russia. Liza’s host family and teachers describe her as a role model for both American and foreign exchange students—she is quietly enthusiastic about everything she does, sees and learns, is the first person ready to participate with a smile on her face, and always far exceeds expectations. Her French teacher said, "I wish I had more students like Liza. She is a leader in this class. I love her."